Located just West of Marbella, Estepona is a beautiful coastal town on the Costa del Sol, near Los Reales de Sierra Bermeja. Popular with locals and tourists alike, this former fishing village has developed over the years into an ideal destination, thanks to its local attractions and climate, which is recognised as one of the world’s best. It is also easily accessible, just 30 minutes from Marbella and Malaga airport less than hour’s drive. In this blog post, we’ll be looking at some of the must-see sights and activities in Estepona to enjoy; whether you’re just visiting on a viewing trip or planning to move to the area. At 2.6km long, La Rada beach is the largest in Estepona. Lined with palm trees and an array of restaurants and bars, its golden sands are the perfect treat for visitors with families due to its playparks and long promenade to explore. The beautifully maintained Lighthouse of Punta Doncella is also found at the south western edge of this beach. Very central and accessible, it does tend to get quite busy in the summer months, so you might want to consider getting there early to grab a sun lounger. If you like a more laid back and quieter atmosphere, the smaller crescent-shaped Playa del Cristo should suit your needs. Its orientation and position protect the beach from cool sea breezes, ensuring the water remains pleasantly warm and calm. Perfect if you want to float in the sea and watch the world go by! The Old Town Quarter in Estepona is a beautiful area full of charm and traditional Spanish architecture and décor. Each cobblestone street tells a story, and historic buildings are in abundance, from the beautiful 16th century Torre Reloj Clock Tower, to the Castillo de San Luis, a 15th century fortress. You can also go and relax at the Plaza de las Flores, a small square lined with pretty trees and flowers and a water feature centrepiece. Enjoy a step back in time with an al fresco morning coffee or evening meal as the busy little square comes to life. 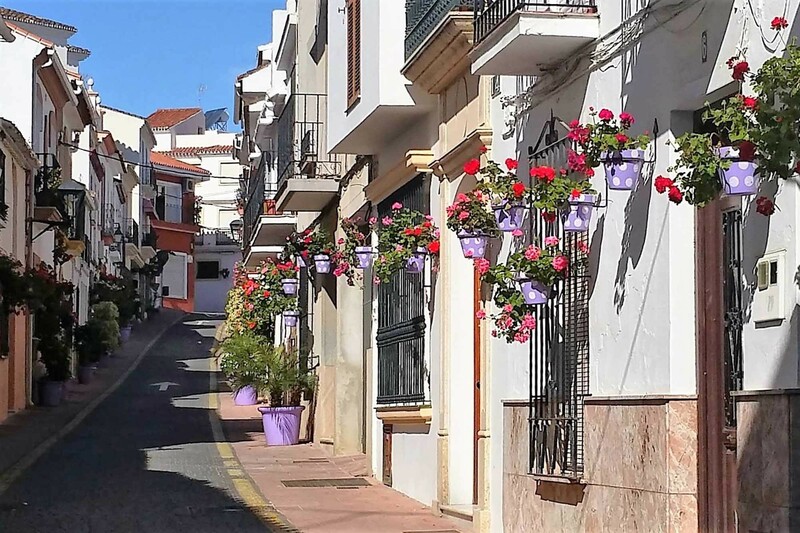 The Old Town area is also home to the Estepona Archaeological Museum, so you can learn all about the fascinating history of the town right back to its pre-historic roots. Other sites of note in this area include Casa de las Tejerinas and the Plaza de los Misioneros. Estepona has a small and charming marina located between the two main beaches of Playa del Cristo and La Rada. The port is surrounded by an array of small bars, cafes and restaurants, so you can enjoy gazing at the luxurious yachts and smaller fishing vessels as they come and go. We recommend visiting in the evening, to enjoy the lively atmosphere and see the boats lit up like Christmas trees and reflecting off the water. On Sundays, a tourist market is held in the marina along the seafront, selling trinkets and accessories. Since 2012, Estepona has become known for a high-quality collection of large-scale murals dotting the cities buildings and structures. Called “La Ruta de Murales Artísticos de Estepona” (Estepona’s Route of Artistic Murals), these works were commissioned by the local Mayor as part of a rejuvenation initiative, and completed by numerous artists, both local and from further afield. They range from a large painting across 6 buildings depicting a fishing scene, to a smaller scale artistic representation of homesickness. Something for fans of all sorts of art. Some are truly stunning, and the artists’ creativity is on full display. While 25 works were originally created, more are being added on a frequent basis such has been their popularity. A full map of all murals from can be found in the local tourist office. Estepona has an abundance of world-class golf courses within the nearby vicinity. The Valle Romano Golf Resort should be suitable for experienced players, with world class facilities and challenging holes. There are numerous other courses within 20 minutes of Estepona, including El Campanario, Estepona Golf and El Paraiso. Time to get practicing! Estepona truly has something for all tastes, and we’ve just begun to scratch the surface here. To truly get a taste for the local area, we recommend booking a viewing trip and seeing it first-hand. Can’t see what you’re after?